Family life is changing. Two-parent households are on the decline in the United States as divorce, remarriage and cohabitation are on the rise. And families are smaller now, both due to the growth of single-parent households and the drop in fertility. Not only are Americans having fewer children, but the circumstances surrounding parenthood have changed. While in the early 1960s babies typically arrived within a marriage, today fully four-in-ten births occur to women who are single or living with a non-marital partner. At the same time that family structures have transformed, so has the role of mothers in the workplace – and in the home. As more moms have entered the labor force, more have become breadwinners – in many cases, primary breadwinners – in their families. As a result of these changes, there is no longer one dominant family form in the U.S. Parents today are raising their children against a backdrop of increasingly diverse and, for many, constantly evolving family forms. By contrast, in 1960, the height of the post-World War II baby boom, there was one dominant family form. At that time 73% of all children were living in a family with two married parents in their first marriage. By 1980, 61% of children were living in this type of family, and today less than half (46%) are. The declining share of children living in what is often deemed a “traditional” family has been largely supplanted by the rising shares of children living with single or cohabiting parents. Not only has the diversity in family living arrangements increased since the early 1960s, but so has the fluidity of the family. Non-marital cohabitation and divorce, along with the prevalence of remarriage and (non-marital) recoupling in the U.S., make for family structures that in many cases continue to evolve throughout a child’s life. While in the past a child born to a married couple – as most children were – was very likely to grow up in a home with those two parents, this is much less common today, as a child’s living arrangement changes with each adjustment in the relationship status of their parents. For example, one study found that over a three-year period, about three-in-ten (31%) children younger than 6 had experienced a major change in their family or household structure, in the form of parental divorce, separation, marriage, cohabitation or death. 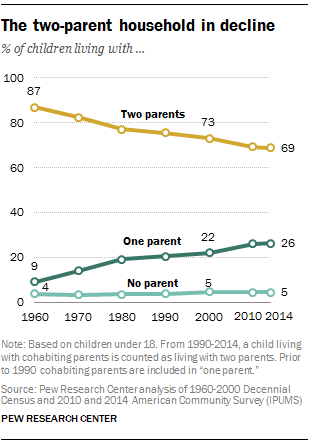 The share of children living in a two-parent household is at the lowest point in more than half a century: 69% are in this type of family arrangement today, compared with 73% in 2000 and 87% in 1960. And even children living with two parents are more likely to be experiencing a variety of family arrangements due to increases in divorce, remarriage and cohabitation.3 Today, fully 62% of children live with two married parents – an all-time low. Some 15% are living with parents in a remarriage and 7% are living with parents who are cohabiting.4 Conversely, the share of children living with one parent stands at 26%, up from 22% in 2000 and just 9% in 1960. Despite the decline over the past half century in children residing with two parents, a majority of kids are still growing up in this type of living arrangement.7 However, less than half—46%—are living with two parents who are both in their first marriage. This share is down from 61% in 19808 and 73% in 1960. An additional 15% of children are living with two parents, at least one of whom has been married before. This share has remained relatively stable for decades. In the remainder of two-parent families, the parents are cohabiting but are not married. Today 7% of children are living with cohabiting parents; however a far larger share will experience this kind of living arrangement at some point during their childhood. For instance, estimates suggest that about 39% of children will have had a mother in a cohabiting relationship by the time they turn 12; and by the time they turn 16, almost half (46%) will have experience with their mother cohabiting. In some cases, this will happen because a never-married mother enters into a cohabiting relationship; in other cases, a mother may enter into a cohabiting relationship after a marital breakup. The majority of white, Hispanic and Asian children are living in two-parent households, while less than half of black children are living in this type of arrangement. Furthermore, at least half of Asian and white children are living with two parents both in their first marriage. The shares of Hispanic and black children living with two parents in their first marriage are much lower. Asian children are the most likely to be living with both parents—fully 84% are, including 71% who are living with parents who are both in their first marriage. Some 13% of Asian kids are living in a single-parent household, while 11% are living with remarried parents, and just 3% are living with parents who are cohabiting. Roughly eight-in-ten (78%) white children are living with two parents, including about half (52%) with parents who are both in their first marriage and 19% with two parents in a remarriage; 6% have parents who are cohabiting. About one-in-five (19%) white children are living with a single parent. Among Hispanic children, two-thirds live with two parents. All told, 43% live with two parents in their first marriage, while 12% are living with parents in a remarriage, and 11% are living with parents who are cohabiting. Some 29% of Hispanic children live with a single parent. The living arrangements of black children stand in stark contrast to the other major racial and ethnic groups. The majority – 54% – are living with a single parent. Just 38% are living with two parents, including 22% who are living with two parents who are both in their first marriage. Some 9% are living with remarried parents, and 7% are residing with parents who are cohabiting. Children with at least one college-educated parent are far more likely to be living in a two-parent household, and to be living with two parents in a first marriage, than are kids whose parents are less educated.11 Fully 88% of children who have at least one parent with a bachelor’s degree or more are living in a two-parent household, including 67% who are living with two parents in their first marriage. In comparison, some 68% of children who have a parent with some college experience are living in a two-parent household, and just 40% are living with parents who are both in a first marriage. About six-in-ten (59%) children who have a parent with a high school diploma are in a two-parent household, including 33% who are living with parents in their first marriage. Meanwhile, just over half (54%) of children whose parents lack a high school diploma are living in a two-parent household, including 33% whose parents are in their first marriage. Many, but not all, remarriages involve blended families.13 According to data from the National Center for Health Statistics, six-in-ten (63%) women in remarriages are in blended families, and about half of these remarriages involve stepchildren who live with the remarried couple. Hispanic, black and white children are equally likely to live in a blended family. About 17% of Hispanic and black kids are living with a stepparent, stepsibling or a half-sibling, as are 15% of white kids. Among Asian children, however, 7% – a far smaller share – are living in blended families. This low share is consistent with the finding that Asian children are more likely than others to be living with two married parents, both of whom are in their first marriage. 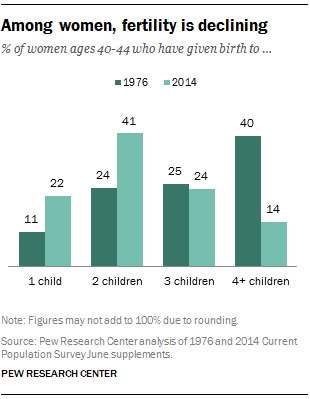 At the same time, the share of mothers ages 40 to 44 who have had only one child has doubled, from 11% in 1976 to 22% today. 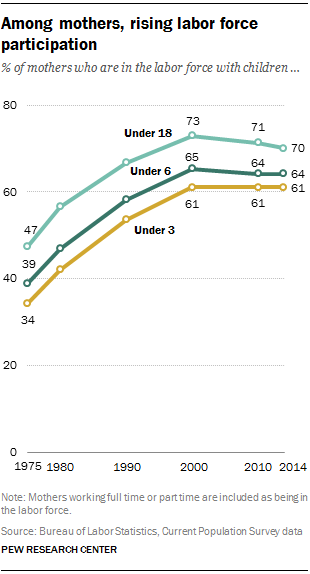 The share of mothers with three children has remained virtually unchanged at about a quarter. 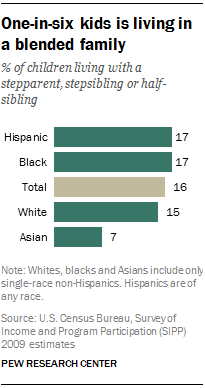 Family size varies markedly across races and ethnicities. Asian moms have the lowest fertility, and Hispanic mothers have the highest. About 27% of Asian mothers and one-third of white mothers near the end of their childbearing years have had three or more children. Among black mothers at the end of their childbearing years, four-in-ten have had three or more children, as have fully half (50%) of Hispanic mothers. Similarly, a gap in fertility exists among women with different levels of educational attainment, despite recent increases in the fertility of highly educated women. For example, just 27% of mothers ages 40 to 44 with a post-graduate degree such as a master’s, professional or doctorate degree have borne three or more children, as have 32% of those with a bachelor’s degree. Among mothers in the same age group with a high school diploma or some college, 38% have had three or more kids, while among moms who lack a high school diploma, the majority – 55% – have had three or more children. Not only are women having fewer children today, but they are having them under different circumstances than in the past. While at one time virtually all births occurred within marriage, these two life events are now far less intertwined. And while people were much more likely to “mate for life” in the past, today a sizable share have children with more than one partner – sometimes within marriage, and sometimes outside of it. Researchers have found that, while marriages are less stable than they once were, they remain more stable than cohabiting unions. Past analysis indicates that about one-in-five children born within a marriage will experience the breakup of that marriage by age 9. In comparison, fully half of children born within a cohabiting union will experience the breakup of their parents by the same age. At the same time, children born into cohabiting unions are more likely than those born to single moms to someday live with two married parents. Estimates suggest that 66% will have done so by the time they are 12, compared with 45% of those who were born to unmarried non-cohabiting moms. The share of births occurring outside of marriage varies markedly across racial and ethnic groups. Among black women, 71% of births are now non-marital, as are about half (53%) of births to Hispanic women. In contrast, 29% of births to white women occur outside of a marriage. Racial differences in educational attainment explain some, but not all, of the differences in non-marital birth rates. New mothers who are college-educated are far more likely than less educated moms to be married. In 2014 just 11% of women with a college degree or more who had a baby in the prior year were unmarried. In comparison, this share was about four times as high (43%) for new mothers with some college but no college degree. About half (54%) of those with only a high school diploma were unmarried when they gave birth, as were about six-in-ten (59%) new mothers who lacked a high school diploma. Related to non-marital births is what researchers call “multi-partner fertility.” This measure reflects the share of people who have had biological children with more than one partner, either within or outside of marriage. The increase in divorces, separations, remarriages and serial cohabitations has likely contributed to an increase in multi-partner fertility. Estimates vary, given data limitations, but analysis of longitudinal data indicates that almost 20% of women near the end of their childbearing years have had children by more than one partner, as have about three-in-ten (28%) of those with two or more children. Research indicates that multi-partner fertility is particularly common among blacks, Hispanics, and the less educated. While parents today are far less likely to be married than they were in the past, they are more likely to be older and to have more education. In 1970, the average new mother was 21 years old. Since that time, that age has risen to 26 years. The rise in maternal age has been driven largely by declines in teen births. Today, 7% of all births occur to women under the age of 20; as recently as 1990, the share was almost twice as high (13%). While age at first birth has increased across all major race and ethnic groups, substantial variation persists across these groups. The average first-time mom among whites is now 27 years old. The average age at first birth among blacks and Hispanics is quite a bit younger – 24 years – driven in part by the prevalence of teen pregnancy in these groups. Just 5% of births to whites take place prior to age 20, while this share reaches 11% for non-Hispanic blacks and 10% for Hispanics. On the other end of the spectrum, fully 45% of births to whites are to women ages 30 or older, versus just 31% among blacks and 36% among Hispanics. Mothers today are also far better educated than they were in the past. While in 1960 just 18% of mothers with infants at home had any college experience, today that share stands at 67%. This trend is driven in large part by dramatic increases in educational attainment for all women. While about half (49%) of women ages 15 to 44 in 1960 lacked a high school diploma, today the largest share of women (61%) has at least some college experience, and just 19% lack a high school diploma. In addition to the changes in family structure that have occurred over the past several decades, family life has been greatly affected by the movement of more and more mothers into the workforce. This increase in labor force participation is a continuation of a century-long trend; rates of labor force participation among married women, particularly married white women, have been on the rise since at least the turn of the 20th century. While the labor force participation rates of mothers have more or less leveled off since about 2000, they remain far higher than they were four decades ago. In 1975, the first year for which data on the labor force participation of mothers are available, less than half of mothers (47%) with children younger than 18 were in the labor force, and about a third of those with children younger than 3 years old were working outside of the home. Those numbers changed rapidly, and, by 2000, 73% of moms were in the labor force. Labor force participation today stands at 70% among all mothers of children younger than 18, and 64% of moms with preschool-aged children. About three-fourths of all employed moms are working full time. Among mothers with children younger than 18, blacks are the most likely to be in the labor force –about three-fourths are. In comparison, this share is 70% among white mothers. Some 64% of Asian mothers and 62% of Hispanic mother are in the workforce. The relatively high proportions of immigrants in these groups likely contribute to their lower labor force involvement – foreign-born moms are much less likely to be working than their U.S.-born counterparts. The more education a mother has, the more likely she is to be in the labor force. While about half (49%) of moms who lack a high school diploma are working, this share jumps to 65% for those with a high school diploma. Fully 75% of mothers with some college are working, as are 79% of those with a college degree or more. Along with their movement into the labor force, women, even more than men, have been attaining higher and higher levels of education. In fact, among married couples today, it is more common for the wife to have more education than the husband, a reversal of previous patterns. These changes, along with the increasing share of single-parent families, mean that more than ever, mothers are playing the role of breadwinner—often the primary breadwinner—within their families. Today, 40% of families with children under 18 at home include mothers who earn the majority of the family income.18 This share is up from 11% in 1960 and 34% in 2000. The bulk of these breadwinner moms—8.3 million—are either unmarried or are married and living apart from their spouse.19 The remaining 4.9 million, who are married and living with their spouse, earn more than their husbands. While families with married breadwinner moms tend to have higher median incomes than married-parent families where the father earns more ($88,000 vs. $84,500), families headed by unmarried mothers have incomes far lower than unmarried father families. 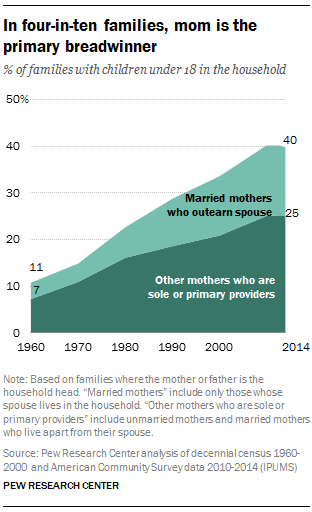 In 2014, the median annual income for unmarried mother families was just $24,000. Breadwinner moms are particularly common in black families, spurred by very high rates of single motherhood. About three-fourths (74%) of black moms are breadwinner moms. Most are unmarried or living apart from their spouse (61%), and the remainder (13%) earn more than their spouse. Among Hispanic moms, 44% are the primary breadwinner; 31% are unmarried, while 12% are married and making more than their husbands. For white mothers, 38% are the primary breadwinners—20% are unmarried moms, and 18% are married and have income higher than that of their spouses. Asian families are less likely to have a woman as the main breadwinner in their families, presumably due to their extremely low rates of single motherhood. Just 11% of Asian moms are unmarried. The share who earn more than their husbands—20%— is somewhat higher than for the other racial and ethnic groups. The flip side of the movement of mothers into the labor force has been a dramatic decline in the share of mothers who are now stay-at-home moms. Some 29% of all mothers living with children younger than 18 are at home with their children. This marks a modest increase since 1999, when 23% of moms were home with their children, but a long-term decline of about 20 percentage points since the late 1960s when about half of moms were at home.